More and more people are living in cities. To encourage families to invest in urban domestic life, an infrastructure of attractive, traffic-protected routes is required to connect urban neighborhoods to meaningful destinations. This year’s symposium focused on urban neighborhood design for children and families and the foundation it provides for health, well-being, and resource conservation in the 21st century. The 5th annual Growing in Place Symposium was presented March 16, 2012, in concert with the 9th annual Urban Design Conference, Urban Reset, held the day after, on March 17, 2012, also in downtown Raleigh. 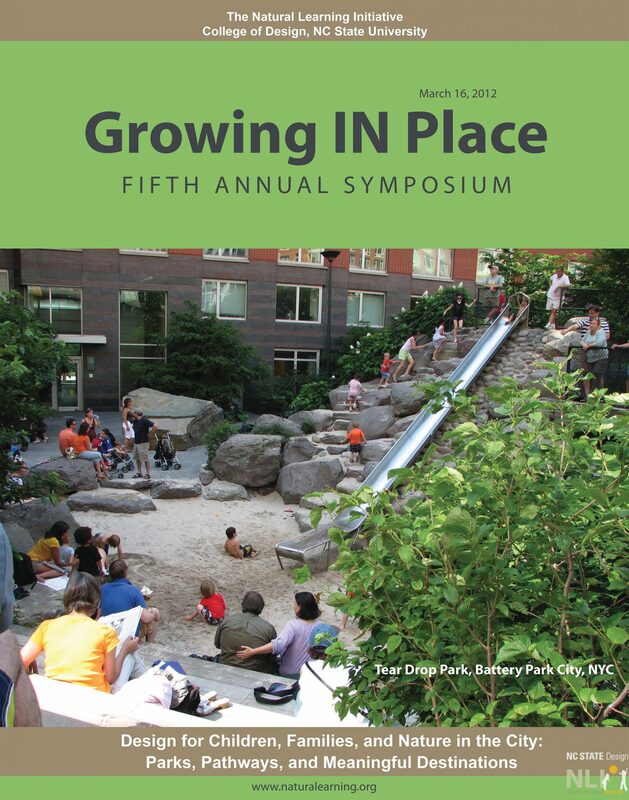 At the Growing in Place Symposium we heard from leading experts on urban pathways, significance of parks, urban “wildlands,” urban food production, and more. Chuck Flink, FASLA, President of Greenways Inc. Greenways and Urban Trail Networks. Adina Cox, MNR, BLA. PhD Candidate, Research Associate Natural Learning Initiative, Urban Greenways What makes them Attractive to Children and Families? Dwane Jones, CNU-A, CPESC, PhD Candidate, College of Design, NC State University, Complete Streets: How Complete? Simon Atkinson, PhD, Professor, Community and Regional Planning, University of Texas and NC State University, Healthy Communities: European Models. Dee Merriam, FASLA, MC&RP Community Planner, Intergenerational Urban Design for Children and Families. Paul Gobster, U.S. Forest Service, In-between Space: Managing Local Landscapes for Wildness and Nature Play. Joanna Massey Lelekacs, Extension Associate, The Center for Environmental Farming Systems. Urban Agriculture as an Integral Part of Local Food Systems.